Principal Cast : Joaquin Phoenix, Jeremy Suarez, Rick Moranis, Dave Thomas, Jason Raize, DB Sweeny, Joan Copeland, Michael Clarke Duncan, Greg Proops, Estelle Harris. Synopsis: When a young Inuit hunter needlessly kills a bear, he is magically changed into a bear himself as punishment with a talkative cub being his only guide to changing back. What we think : Mediocre Disney film about the typical moral and ethical tropes – being true to oneself, how Hunting Is Bad, and Bears Are Good. The animation is excellent, but the Phil Collins’ songs are nowhere near the level of 1999’s Tarzan, and the story feels underwhelming, if a little generic. In the waning days of Disney Animation Studios’ traditional 2D animated art-form, as people moved away from the old style of ink and paint towards the bright, shiny new concept of 3D animation, Brother Bear snuck into cinema’s a quickly died a paupers death: unloved and unwanted. Commercially one of Disney’s least successful animated ventures, I decided to give it another look to determine whether this poor, unfortunate film, deserved that moniker and reputation. 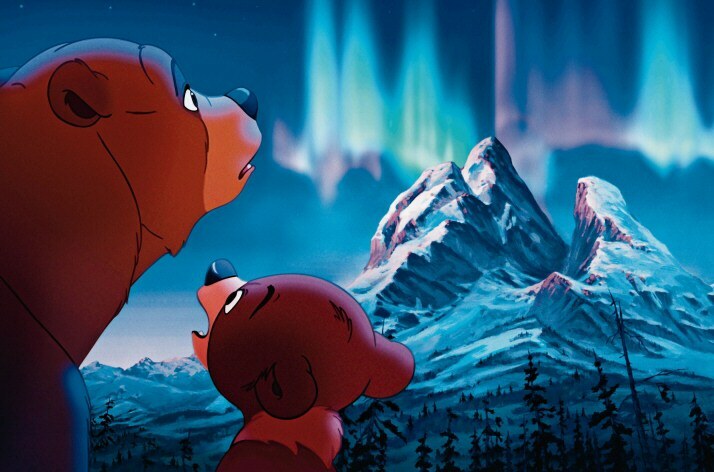 Unlike previous films, such as Aladdin, The Little Mermaid, Pinocchio and other Disney classics, Brother Bear was an original story, something that could either fail or succeed as a concept depending on both the competency of the storytellers as well as the mood of the audience at the time. Whereas most audiences had at least an idea of what to expect with films based upon previously published works like Beauty and The Beast, with Brother Bear, it was a whole new concept. The characters were unknown, the story was unknown, and all you had to go on was the Disney brand and the music of Phil Collins. When a young boy naked Kenai is transformed into a bear after slaying one of the beast in revenge for the death of his brother, he has to try and find a way to discover the secret that will return him to human form, no matter how arrogantly he stomps his foot. Kenai, you see, is a little bit loose with his attitude, and while his family will tolerate it a little, his arrogance ends up costing his brother his life, in a thrilling pursuit onto the side of a cliff that ends with tragedy. The spirits of the mountain turn Kenai into a bear to teach him a life lesson, about walking in another footsteps and not prejudging without thinking, and the story kicks on from there. Along his journey, Kenai befriends young Koda, the son of the bear Kenai just killed, the fact that causes Kenai to feel another pang of emotion: guilt. 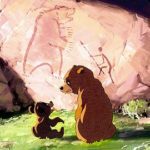 While the characters are not particularly memorable in Brother Bear, they are well defined and certainly developed quite well: the way the humans interact with each other is exquisitely done, and the facial expressions of all the human characters is perhaps more believable than I’d come to expect from 2D animation. Kenai, his brother Sitka, and the middle sibling Denahi, all act like real brothers, a little niggle and biffo accompanying a genuine sense of affection towards each other. 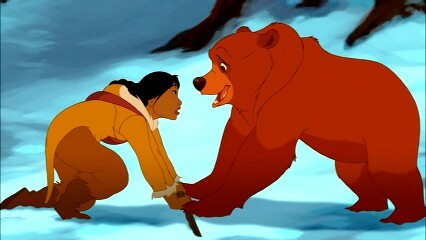 However, it takes the death of Sitka in fighting a bear, to provoke the story along, as Kenai follows and attacks the bear (which then causes Kenai to change), and Denahi follows shortly afterwards, mistakenly believes the bear-form Kenai to have killed the human-form Kenai, and follows the bear-form Kenai to seek his own revenge. Convoluted, and a little complicated, it’s actually a genuinely emotional story. The story is strong enough to engage the audience, coupled with some pretty decent animation (more on this shortly) and upon reflection, however, I found the film to be a little weak in the scripted dialogue between the humans, which, for the first twenty-odd minutes of the film, leaves one feeling cold towards the characters, and the film thus never fully recovers.When Kenai transforms into his bear form, the film picks up a lot, with the cute and cuddly Koda entering the picture, voiced perfectly by Jeremy Suarez, with all the hip-hop cool of a kid twice his age. The chemistry between Koda and Kenai is palpable, although I tend to think it’s slightly one-sided towards the younger bear, rather than Kenai. 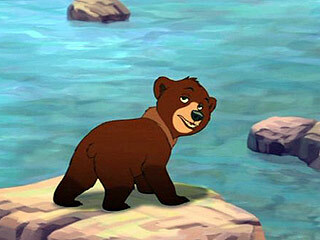 Joaquin Phoenix voices Kenai in both human and bear form, and while he is good at the part, lacks a certain gravitas to pull it off emotionally. It’s a typical Disney-fied product, very well developed, but ultimately, Phoenix’s performance rings hollow. The animation and production design is, as you’d expect from a Disney production, absolutely first rate. Utilising a two-aspect ratio format, which serves as a storytelling platform in a way, Brother Bear uses some of the most amazing artwork you’ll get in a 2D film. While the film is running, and Kenai is in his human form, the film utilises a 1.77:1 aspect ratio, which, the director tells us on the DVD’s bonus features disc, represents Kenai’s narrow and small view of the world. However, when the boy is turned into a bear, the film opens out into a wider, more epic 2.35;1 aspect, with an enhanced and more dynamic color palette and slightly different (read: more traditionally cartoony) animation style. This change in aspect ratio’s will confuse some viewers however, it’s a really clever way of presenting the view of the world from an overall cinematic perspective. The first twenty minutes of the film, told when Kenai is human, are drawn in a relatively realistic way, with muted colour tones and an overall lack of super-detail: this is changed when the film widens out, and the color simply pop off the screen. The use of the widescreen aspect is one of the marvels of animation, as the increased width enables more detail, a greater sense of perspective and ultimately, a more encompassing style of animation to take hold. Musically, Brother Bear is quite cool, considering you have the musical talent of Phil Collins behind the project, as well as Disney favourite Mark Mancina, who together combine to produce a great soundtrack, filled with naturalistic instruments and some great songs. Collins’ work here is first rate, although it’s a pity the film didn’t generate the same commercial success that Tarzan did a few years earlier. Brother Bear never manages to reach the giddy heights of the post Lion King euphoria of Disney’s 2D animation stable, and nor should it. Brother Bear is a lot more an intimate storyline, a great deal more humanistic (even if one of the central characters spends the majority of the time as a bear) and with an emotional connection everybody can understand. The message of the film is perhaps a little heavy handed, but in true Disney style, it’s all wrapped up neatly by the end, and you finish watching the film with a great big smile on your face. Brother Bear will perhaps never be considered a true classic from the studio, but it’s still a great little film that deserves your time in watching. Brother Bear: better to have loved and lost than never to have loved at all? 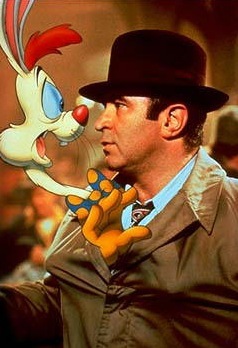 Movie Review	Movie Review – Who Framed Roger Rabbit?